This past week has seen me (pleasantly) hijacked by some of the ladies in the Sheffey family. I will raise my hand and admit that I have neglected them shamefully over the past year. The quietude of the holiday period was the perfect time to redress this. 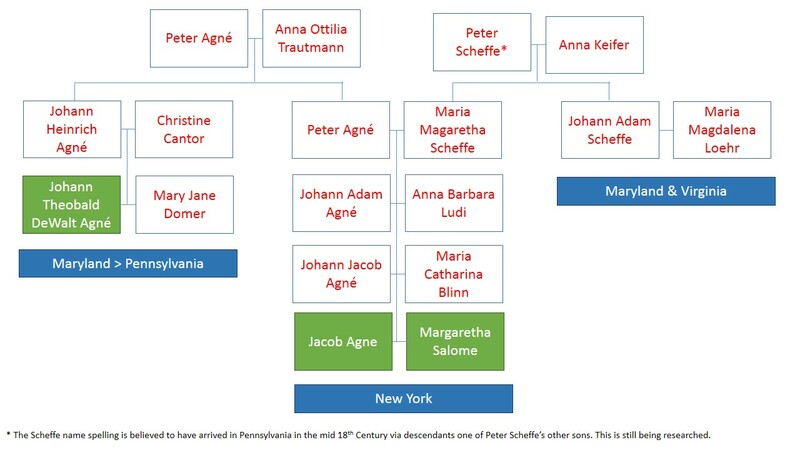 So I began with Peter Scheffe’s daughter, Maria Magaretha Scheffe, wife of Peter Agné. This was the couple who inherited Peter Scheffe’s mill in Herschberg (Südwestpfalz, Rhineland-Palatinate) upon his death. The saga of the Agné family is an incredible story. It is the story of the mass migrations of people in continental Europe during the 16th and 17th Centuries. It is also the story of 18th & 19th America, particularly the story of that idealology referred to as Manifest Destiny. As with many European families, the Agné family had some genealogy hurdles, namely a large number of variations in the spelling of its surname: Ankney and Anquenet were two of the most popular. Thankfully, however, this is a well-documented family. This is rare as they were largely a farming family. With that said, the family’s line has been traced back to Benjamin Anquenet Ankney born in 1575 who married Elisabeth Brase Prassin. The couple is associated with Pfalzburg, Lorraine an area which has ping ponged back and forth between France and Germany for centuries. As you can see by the names, there is a distinct French connection. Religion would shape the family’s destiny in Europe. At some point in time the Agné family converted from Catholicism to Calvanist Protestantism. Without giving a long history lesson, relationships between French Catholics and French Protestants (called Huguenots) were bloody right from the beginning. These weren’t just bitter feuds, this was all out warfare which subsided with the signing of the Edict of Nantes on 13 April 1598 by Henry IV of France (http://en.wikipedia.org/wiki/Edict_of_Nantes ). The edict was meant to restore national unity in France. It was never an easy peace. The Edict of Nantes was revoked by Louis XIV (the grandson of Henry IV) in October 1685. The revocation of the edict drove an exodus of Huegenots to Protestant nations such as the Netherlands, England, Denmark, Sweden, Norway and Protestant-held principalities and duchies in Germany (The Germany we recognise today didn’t exist until the 1860s.) Agné and Ankneys can be found in all of them. Benjamin’s grand-son, Peter Agné, was part of this exodus. He was born in Pfalzburg, Lorraine in 1650 and married Anna Ottilia Trautmann (born 6 May 1655 in Lambsborn, Kaiserslautern, Rheinland-Pfalz, Germany). It’s uncertain when the couple and their family fled Pfalzburg for Anna’s homeland of Lambsborn, Kaiserslautern, Rheinland-Pfalz in Germany. The best indication is the birth date for their first child, Anna Catharina Agné, which is 21 Jun 1679. It’s not a coincidence that this fell within a period when anti-Huguenot reprisals had begun to resurface. Sensing the way things were going for Protestants in his homeland, Peter must have made the considered decision to quit and removed his family to his wife’s native land. German territories were wracked by a series of wars throughout the early 18th century. The Palatinate region was particularly hard hit. As with most wars, famine followed. These factors combined and led to what’s called the German Exodus to Britain, The Netherlands and the American colonies from 1709. The Agné family held on until at least the middle of the 18th Century. And then, there began a series of migrations out of Germany to other Protestant lands and the American colonies. Great Grandson: Jacob Agne (Birth 11 Aug 1795 in Lambsborn, Kaiserslautern, Rheinland-Pfalz, Germany | Death 27 Mar 1865 in Utica, New York, USA). He is recorded in New York with his wife Margaretha Salome (maiden name unknown) and sons Jacob & Carlin in 1860. I haven’t been able to definitively determine when this family group arrived in the US. Jacob was the son of Johann Adam Agné and Anna Barbara Ludi. Nephew: Johann Theobald DeWalt Agne / Ankney (Birth 16 Nov 1727 in Lambsborn, Kaiserslautern, Rheinland-Pfalz, Germany | Death 4 Mar 1781 in Clear Spring, Washington, Maryland, United States). DeWalt Ankney (the surname spelling changed upon arrival in the US) arrived in 1746, aged 19. He settled in Pennsylvania at some point prior to his marriage to Jane Domer in 1748 in Lancaster County, PA.
Dewalt Ankney’s arrival in the American colonies falls roughly within a close time frame to Johann Adam Scheffe/Sheffey’s (Maria Magaratha Scheffe- Agné’s brother) arrival in the Maryland. The Agne/Ankey’s joined a growing German population in the American colonies of New York, Maryland and Pennsylvania. War, religion and famine would appear to be the main reasons behind these migrations. It would be fair to say that the Ankney family which settled in Pennsylvania prospered. They owned their own land which they farmed and the family grew. Believe me when I say I almost regretted researching this side of the family. It is enormous. I had allocated three days to research it. It took a week. But I am glad I persevered. Yet again, the family perfectly illustrates the pulse of history – this time on American soil. The family did its duty, providing sons to the American Revolution. Afterwards, they returned to their farms in and around Lancaster County, Pennsylvania. And there I expected them to remain. After all, their Sheffey cousins remained where they were in Maryland and Virginia. After the Revolution, Pennsylvania was the breadbasket of the newly formed America. Those farmers who owned land prospered very well indeed. And here lays another mystery. They (very) extended family largely owned the land it farmed. It was part of tight-knit German-American community. They had every reason to stay where they were…yet, they didn’t. From about the 1860s onwards, for the next decade, Akney and Akney left Pennsylvania and headed west. The first waves settled in Ohio and later pushed on to Indiana and Illinois. Later generations in the 19th Century settled Michigan as well as states further west and north, ultimately reaching California, Washington and Idaho. One branch even migrated to Canada, where they remained for a few decades before returning to the northern Midwest states. Apart from the foray into Canada, the family settled in regions and towns with large German immigrant, German-American and Scandinavian immigrant communities. This in part, is one key to the answer. However it doesn’t really explain leaving the security and prosperity of life in Pennsylvania behind for the entirely unknown…and dangerous. Yet they did leave that security of the known behind. And their trek coincides with that period of time covered by Manifest Destiny, that widespread early to mid 19th Century belief that Americas were destined by God to command and own the remainder of the American territories not already claimed by British-ruled Canada (http://en.wikipedia.org/wiki/Manifest_destiny). Wave after wave of settlers from the east moved to the Midwest, which was also a popular destination with a new surge of immigrants. I’m not here to debate the ethics of Manifest Destiny and the ultimate outcome for the Native American population in these territories. I cite this as I don’t want to appear to gloss over that particular chapter of American history. As territory after territory was claimed by the US government, and as new states were formed, the Ankneys were there. In a very real and tangible way, the Ankneys, like many Midwestern American families, were a part of this expansionary history of America. They didn’t read about it in papers. They lived it. In tracking and recording the Ankney family’s overall history, I’ve caught snatched glimpses of the pulses of history and how these pulses usually dislodge entire groups of people. It’s a dynamic that echoes to this day. I don’t really think we, as Americans, appreciate how this country was founded upon large scale and catastrophic events which led to the disruptions of whole groups of people. These disruptions came about through the convergence of circumstances far beyond the control of the common people. That thought didn’t cross my mind until I began researching this particular family. The Ankneys – a family that has been on the move for the best part of 300+ years. I’m smiling as I recall my new favourite phrase: family history is history in microcosm. Indeed, it is. Clash of the titans: Ancestry.com vs FamilySearch.org. And the winner is…? Hubby’s family has Ankney’s from the Ohio branch of this group. Estel Ankney (1918-2002) married Opal Glick (1921-2012) 1st cousin 1x removed of my husband. Paulding Ohio area. Hello Gayle. A Happy New Year to you and yours. Thank you for the comment. It’s nice to hear from you. The Ankneys were a great branch of the family to research…what a journey through history! Hi, I just started doing my Ankney tree and came across this blog. You mentioned Benjamin and then his grandson Peter, but skipped over Benjamin’s son (which is Peter’s father). Is it Josef or Abel? Did you find out who Benjamin’s father was and his father as well? Do you have DOB’s and DOD? I am part of the Michigan Ankney’s but my father was born in Wisconsin and lived in Canada until late teens. Then moved to Michigan. Hello to all my cousins that I have not met yet. As a Michigan born Ankney, I thought this was an awesome read. Thanks you. I would love to hear more of see how my ancestors may have been linked to the Huguenots of France. It’s a pleasure to hear you enjoyed reading the post. The story that came from your side of the family was a great one to research, especially from a European and American historical perspective. Peter Scheffe (I suspect his full name was Johann Peter Scheffe) is still proving stubbornly elusive in the official records before his appearance in Herschberg, Germany. That one seemingly throwaway line that he was a French shoemaker in his youth has led me to delving into digitized French archives. I have yet to find the Scheffe or Scheoffe name in any French records about known Huguenot families. That’s not to say his family weren’t Huguenots. I just haven’t found them yet. This will probably take a trip to France to uncover. I’ve found Huguenot Scheffe’s who fled France in the 16th and 17th Centuries for the Netherlands and England. I have yet to find those who fled to Germany. This may (and probably does) have to do with the 100 years War, were countless vital records were destroyed due to warfare.Dear great grandad Peter may always remain an enigma. I’d love to know his story, though. To go from a poor shoe making immigrant to the Mayor of a town and prosperous business owner in 18th Century Germany was quite the accomplishment. An exceedingly rare one. There’s quite a story somewhere in there. Have you read the published Ankney genealogy/family history ebook? If not, I’ll happily shoot you the link to it. There was a Nicholas Angeny, who I believe is from this same Agne line. (It’s possible he was Johann Nicholas). He came to the US on the ship named “Harle” and landed in Philadelphia in 1736. He brought with him his wife and one child, a son. Nicholas and his descendants settled the Bucks County region, became Mennonites, and also owned a mill, very similar to the mill you mention in Lambsborn. This whole line of the family settled in Bucks County, PA and the Philadelphia area and are there to this day. The person writing down the name at the docks in Philadelphia in 1736 spelled it “Angeny”. I was told that Nicholas was directly related to DeWalt, but I’m not sure of the exact connection. Perhaps Nicholas was DeWalt’s uncle? I’ve been searching for years for confirmation that my ancestor Nicholas, who was on the ship Harle, was indeed connected to the Agne’s of Lambsborn, DeWalt, the Trautmann’s, the Vinot/Vinan family from Alsace-Lorraine, etc. But I have not yet been able to find a proven connection. If anyone has any information that connects these dots, I’ve love to know. FYI — my understanding is that “Anguenet” is simply the French spelling/pronounciation of Agne. And Brase is the German version of Prassin. Checking back, 3 years later, to see if anyone has learned any new information connecting the Angeny and Ankeny/Ankney lines? Canadian born Ankney. West coast. Beautiful B.C. Hello to all of my relatives. If only I was able to meet all of you. That would be a proud and amazing adventure. Stand proud and watch over each other. Love and peace to my entire clan…. and all the rest of you runners up….lol. I just read you story on the Ankney family and it is interesting! I’m decended from David Wesley Ankney and Emmaline Pierce. It gets a bit rough connecting the family tree and I googled a lot to help out. I have done Ancestry DNA and connected to a few. But still working on it because sometimes things with dates don’t match and there is so many Joseph’s. I thank you for sharing this and it may help me I hope. My name is Fred Berl Ankney Sr. I am the seventh generation of direct sons of DeWalt. I am one of many who has been researching the family for about 30 years. I have much info, but not much energy. I will try to share as much as I can. DeWalt settled in Clear Spring Md. where he owned 500 to 900 acres, There is a church there where he built one a couple centuries ago. He and many other family members were buried behind the church. The land was eventually used as a Cherry orchard. There is a plaque by the road that tells about “he was the father of his name. If you go to the history building in Hagerstown they have a folder about him and a map to show where he lived. He refused to learn English. Hagerstown is about 30 miles south west of Gettysburg Pa.
Peter (my 2nd male ancestor on this continent), his brother and DeWalt were all officers in the Rev. war. (To tired to spell it) If you are a direct descendent with a daughter or more they can join The Daughters of the American Rev. (I wouldn’t, I don’t like em.) There are benefits. Peter and brother followed the frontier to Somerset County in Pa. They are both buried in the church yard of Jennerstown Pa on the main St., Ankney Ave. They are side by side in German style graves with much inscription. Don’t know why I said that. You people should be ashamed of yourselves, keeping a geezer like me up this late at night. It’s almost 8. I gotta have a beer and go to bed. My email is fred_ankney@yahoo.com. I’ll try to help. Thank you for sharing, Fred. My Ankney cousins certainly have a remarkable history. I am a descendant of Ankney clan of Somerset County, PA by way of Norman Ankney of Westmoreland County, PA. The frontier west of the Appalachian Mountains in Pennsylvania and Virginia was well known before it was legal to claim land with the Treaty of Fort Stanwix of 1768. Numerous roads we use today came initially into existence as a result of using existing Indian footpaths as well as expanding new British Army supply roads to support strategic outposts like Ft Cumberland, Ft. Ligonier, and of course Ft. Duquesne/Ft. Pitt long before 1768. It would have been long, but not impossible to get to Somerset, PA from Clear Spring, MD by way of Cumberland, MD back then. It is interesting to read the Ankney family history from the Sheffey perspective for a change. Thank you for your interest in your distant cousins. Hi, distant Cousin! My father was Bruce Porterfield, his mother Viola Ankney (spelled differently at one point but the same Ankenys)…Her father was Gilbert Ankney, Gilbert’s father was Lawrence, Lawrence’s father was Peter, his father Christian Jr, his father Christian Sr. Neat stuff. I grew up near Champion, PA near the point where Westmoreland meets Somerset and Fayette counties. After the Revolutionary War & the War of 1812, veterans were given bounty lands in many of the Old Northwest Territory when it became states. (WI, IN, IL, etc). Could that be a partial motive for the Ankney families moving on?? Thank you for this. I am a decedent of DeWalt through his son, Christian. I was born just a few miles from where his brother Peter is buried at Ankeny Square in Somerset county, PA with next to his wife Rosina Bonnet. I live even closer to Ligonier, PA. The Ankenys I come from owned a farm there that was in the Ankeny family for 200 years. Cook Township, PA to be exact. My grandmother was born on that farm, as was my father. Up until 2017, she lived right across the stream from that farm. Amazing to think they once farmed that entire valley! I love the Ankeny family history. Very interesting!